Pack up this Embroidered Breast Cancer Awareness Lunch Cooler with healthy food and beverages and you're ready to go! This Embroidered Lunch Cooler is great for spreading awareness at work or awareness events and can be easily carried for everyday use. Perfect to keep your food cool and fresh while you’re at school or work. Our breast cancer awareness merchandise also makes for thoughtful gifts. 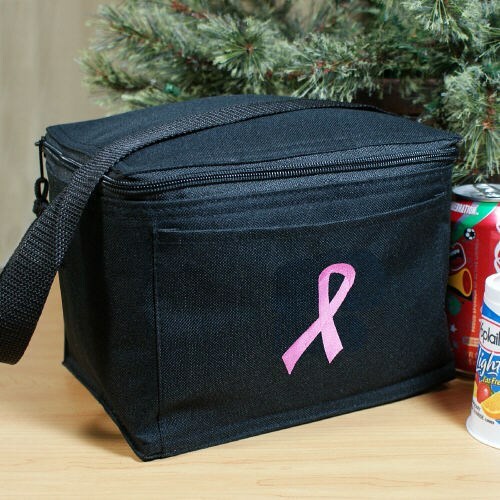 Your Embroidered Lunch Bag for Breast Cancer Awareness features sturdy polyester with heavy vinyl backing and measures 8 1/2" W x 6 1/2" H x 6 1/2" D. Comes in Black and Navy. Each Embroidered Lunch Tote is insulated and features a comfortable and strong handle. In addition, the lunch bag includes a convenient front pouch for leaving a note along with a Zipper top closure to secure your lunch time meal. The product received was exactly as advertised. The quality is excellent and it arrived very quickly. Additional Info The breast cancer journey affects not just the person with breast cancer, but their entire support system comprised of family, friends, and health care professionals. Help spread the awareness of Breast Cancer with our collection Breast Cancer Awareness Apparel and Walk Gear. For each item purchased, MyWalkGear.com will donate a portion of the proceeds to the funding of research and treatments to help those who need us the most. Be sure to also take a peek at our Breast Cancer Hope Ribbon Hoodie and our Embroidered Pink Ribbon Ladies Sweatpants as well.